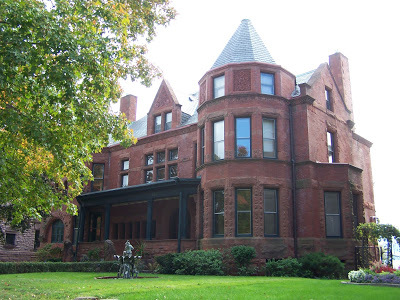 Built in 1889 by Edgar Long, the home was designed by the Cass Gilbert and James Taylor (who also built together the home next door, 322-324 Summit Avenue). At the time, this amazing home was built for only $30,000. It is reported that Mr. Long was the in the lumber business, as were many of the wealthy home owners on Summit, and the general manager of the Railway Supply Company. Amazingly, not much has changed with this home. While many homes in the area have lost their porches, or had additions put on the home, this home has only had a few minor changes. The coach port, as seen in this photo, has been enclosed and now houses the kitchen on the main floor, with a sun room on the second level (addition). For the grand homes on this side of Summit, the kitchens were originally located in the basement, with food delivered via dumb-waiters. It was believed that the smell of food would cause appetites to sour, so all food was prepared below the home. The new kitchen, since placed in the once porte cochere, has the exterior wall of the home as an interior wall, letting you see the grand door arches that were once entrances into the home from a carriage. The rear of the home has seen some changes, namely to the porch stairs, as well as the missing railing on the top balcony, and the third story breeze way has been enclosed with glass. You can see how the home looked in 1890 from this photo. At about 7600 square feet, the home is very large, with seven bedrooms, five bathrooms, and a third story game room. One of the draw backs would be the one car garage underneath the kitchen, but many of these homes lack adequate garage stalls. The saving grace is that the garage is a drive through into the back yard, offering further private parking if needed. 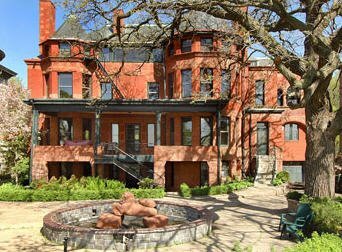 When these mansions were built, carriage houses existed to the rear of the home, but most of these are long gone. At 332 Summit, the ruins of the original carriage house are still present. The home recently sold in 2006 for $1,499,000. This entry was posted on Thursday, June 24th, 2010 at 2:35 am	and is filed under Queen Anne Victorian, Richardson Romanesque, St Paul Historic Homes, Summit Avenue. You can follow any responses to this entry through the RSS 2.0 feed. You can leave a response, or trackback from your own site. Amazing houses. Its like a castle for me. Thanks for the blog, I enjoy reading it. Thanks for reading! Our architecture here in the Twin Cities is pretty amazing. Was this the Archibald Guthrie home? Yes, Archibald Guthrie was the second owner of this home.